Richard Follett is Deputy Pro Vice Chancellor (International) and Professor of American History at the University of Sussex. A historian of slavery and emancipation in the United States and Caribbean, Follett enjoys a strong international reputation for his scholarship and public engagement work. An accomplished university administrator and educator, Follett has a wide range of HEI experience, particularly in the field of international education. Brought up in Bangor, Wales and Bristol, England (with spells in the United States), Follett attended the University of Wales, Swansea and the University of Illinois for his BA degree. He obtained an MA from the University of London in 1991 before receiving a Fulbright scholarship to support his doctoral work on American slavery at Louisiana State University. Before moving to Sussex in 1999, he taught at the National University of Ireland, Galway. He has held visiting teaching and research appointments at the University of Lagos (Nigeria); Nanjing and Peking Universities (China) and at University College London. He speaks Spanish fluently and is attempting to learn Hindi and Mandarin. Follett is a historian of slavery and emancipation and has published widely on U.S and Caribbean history. His publications and current book project on enslaved rebellion is detailed in the 'research' tab on this profile. As Deputy Pro-Vice Chancellor (International), Follett is charged with developing the University of Sussex's institutional vision for academic engagement worldwide and for promoting international student recruitment and mobility, be it at the Brighton campus or via Trans-National Education. To follow his international engagement work on behalf of Sussex, please consult his Linked-In and Twitter profiles. 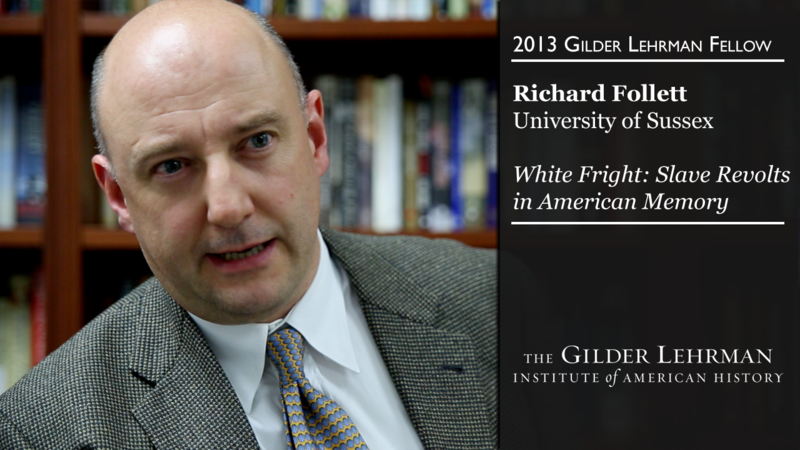 As Gilder Lehrman Fellow at the Gilder Lehrman Institute of American History in New York City, Richard Follett was interviewed about the book project White Fright and the research he conducted as Gilder Lehrman Fellow on the 1741 New York Slave Insurrection Conspiracy. Sky News: Should Slavery Be Made Essential Reading? 12 Years a Slave was among the most graphic films ever made about American slavery. Following the movie's release, director Steve McQueen and lead actor Chiwetel Ejiofor were quoted as saying that Solomon Northup's autobiography (first published in New York in 1853) should be on the National Curriculum for British school-children. Sky News covered the story with a special report which is available here: Slavery 'Should Be Made Essential Reading', which they followed up by interviewing Richard Follett of Sussex University and then Miranda Kaufmann, historian and freelance journalist. Follett has also produced short films on Twelve Years a Slave and other Narratives of Slavery for Teachinghistory.org, a high-traffic site for U.S. high-school teachers, 5,000 of whom have downloaded Follett's videos on how to teach American slavery. Solomon Northup was an exceptional man, not just in his life history, but also in his literacy. A recent review by Follett on slavery and the power of literacy is available in Times Higher Education. Follett delivers public lectures on slavery and emancipation in the US, UK, and West Africa. His work has been published in a range of popular periodicals, ranging from Louisiana Cultural Vistas to BBC History Magazine. His research has also contributed to the cultural heritage of slavery and is used to promote public education and tourism in Louisiana, His book, the award-winning Sugar Masters bridges the divide between scholarship and public knowledge and is sold widely at plantation homes and tourist sites across the state. On various plantation tours, it is employed by guides and serves as "a perfect complement to the tour and interpretive programming." It has even be used to provide historical context for visitors planning motorhome tours of the state. 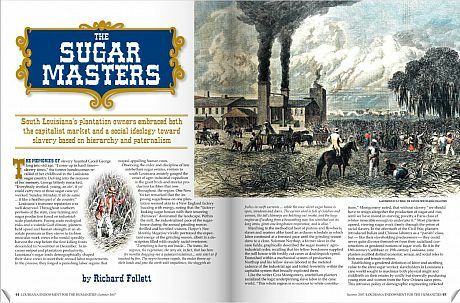 "I could not have written my novel, The Cutting Season, without books like Richard Follett's astoundingly well-researched, Sugar Masters. For me, writing believable fiction that can emotionally reach readers and also teach them about different eras in our shared history requires reading texts like these."